The photon mapping method is one of the most popular algorithms employed in computer graphics today. However, obtaining good results is dependent on several variables including kernel shape and bandwidth, as well as the properties of the initial photon distribution. While the photon density estimation problem has been the target of extensive research, most algorithms focus on new methods of optimising the kernel to minimise noise and bias. In this paper we break from convention and propose a new approach that directly redistributes the underlying photons. We show that by relaxing the initial distribution into one with a blue noise spectral signature we can dramatically reduce background noise, particularly in areas of uniform illumination. In addition, we propose an efficient heuristic to detect and preserve features and discontinuities. We then go on to demonstrate how reconfiguration also permits the use of very low bandwidth kernels, greatly improving render times whilst reducing bias. Ben Spencer and Mark W. Jones. 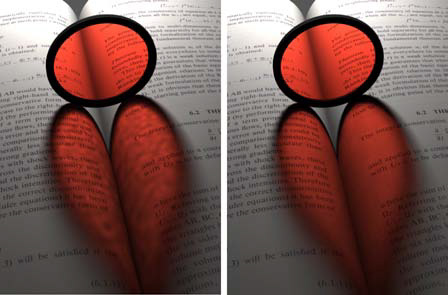 This entry was posted in Computer Graphics Forum, Publication and tagged CGF, Journal paper, Photon Mapping on March 27, 2009 by Mark. The availability of commodity volumetric displays provides ordinary users with a new means of visualizing 3D data. Many of these displays are in the class of isotropically emissive light devices, which are designed to directly illuminate voxels in a 3D frame buffer, producing x-ray-like visualizations. While this technology can offer intuitive insight into a 3D object, the visualizations are perceptually different from what a computer graphics or visualization system would render on a 2D screen. This paper formalizes rendering on isotropically emissive displays and introduces a novel technique that emulates traditional rendering effects on isotropically emissive volumetric displays, delivering results that are much closer to what is traditionally rendered on regular 2D screens. Such a technique can significantly broaden the capability and usage of isotropically emissive volumetric displays. Our method takes a 3D data set or object as the input, creates an intermediate light field, and outputs a special 3D volume data set called a lumi-volume. This lumi-volume encodes approximated rendering effects in a form suitable for display with accumulative integrals along unobtrusive rays. When a lumi-volume is fed directly into an isotropically emissive volumetric display, it creates a 3D visualization with surface shading effects that are familiar to the users. The key to this technique is an algorithm for creating a 3D lumi-volume from a 4D light field. In this paper, we discuss a number of technical issues, including transparency effects due to the dimension reduction and sampling rates for light fields and lumi-volumes. We show the effectiveness and usability of this technique with a selection of experimental results captured from an isotropically emissive volumetric display, and we demonstrate its potential capability and scalability with computer-simulated high-resolution results. IEEE Transactions on Visualization and Computer Graphics, March-April 2009, Vol. 15. No 2, pp. 221-234. This entry was posted in Publication and tagged Journal paper, Light field, TVCG, Visualization on March 23, 2009 by Mark. Ben Spencer and Mark W. Jones won the 2009 Computer Graphics Forum cover competition with this image. 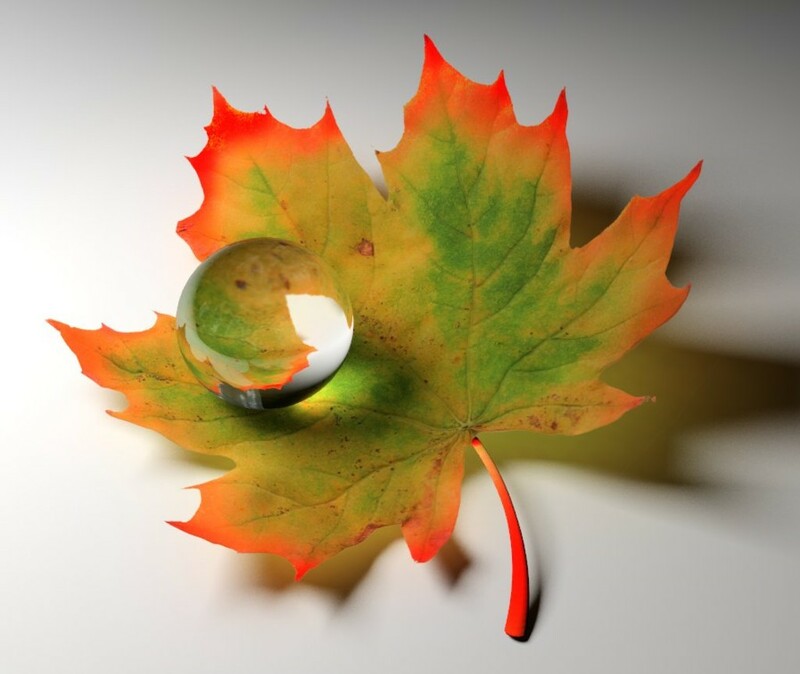 The caustics underneath the sphere and leaf are generated using an enhanced photon mapping algorithm described in Into the Blue: Better Caustics through Photon Relaxation, Ben Spencer and Mark W. Jones, Eurographics 2009. The advantage of the approach is that low-noise radiance estimates may be achieved using very low bandwidth kernels. The caustic photon map in this scene contains 120,000 photons and only 50 are used in each radiance estimate. We can achieve good-quality results with as few as 20 photons. This results in the reduction of proximity, topology and boundary bias and also reduces the time required to render caustic illumination. The scene was created using a scan of a real leaf, post-processed and overlaid onto a translucent scattering dielectric film perturbed using a fractal noise function. Clip, gloss and bump maps were then created and the whole scene rendered using our own global illumination rendering platform. This entry was posted in Uncategorized and tagged Award, Photon Mapping on March 1, 2009 by Mark.